Projects sometimes have their beginnings with a single inspiration – sometimes a particular piece of furniture, sometimes a page torn from a magazine. These inspirations are valued by a designer for what they say about the mood of the intended home. In this case, the spark was a unique bar set, found at a flea market and lovingly restored. This piece formed the touchstone for this home remodel as it progressed ( and still progresses) from room to room. 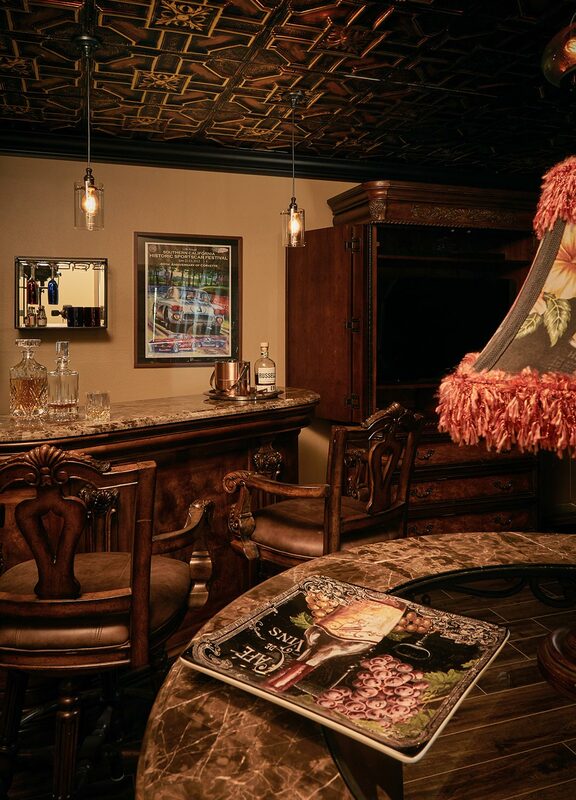 The reclaimed bar set presides in this cozy bar tucked beside the new wine cellar. The homeowner’s desire for a space to claim as his own goes beyond the “man-cave” concept; these spaces form a core for private conversations or the entertainment of fortunate guests. 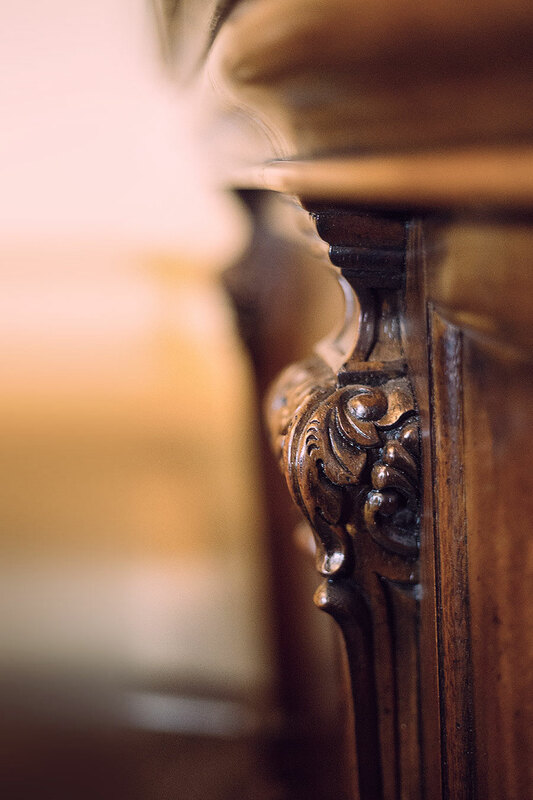 The warmth and period feel of the room is derived from the authenticity of the carefully selected pieces which inhabit the rooms, each of which contributes to the whole. 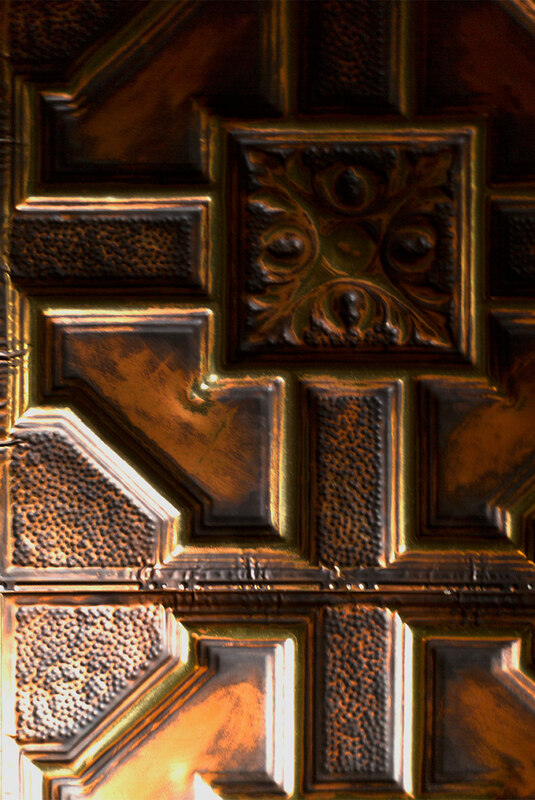 A tin ceiling found so often in european pubs is an example of the homeowner’s unsparing devotion to detail and atmosphere. The remarkable finish adds its warmth and shine to every interior view and visually draws the apparent height of the room down to a cozy, more intimate space. Authentic details everywhere one looks invite close inspection and touch. 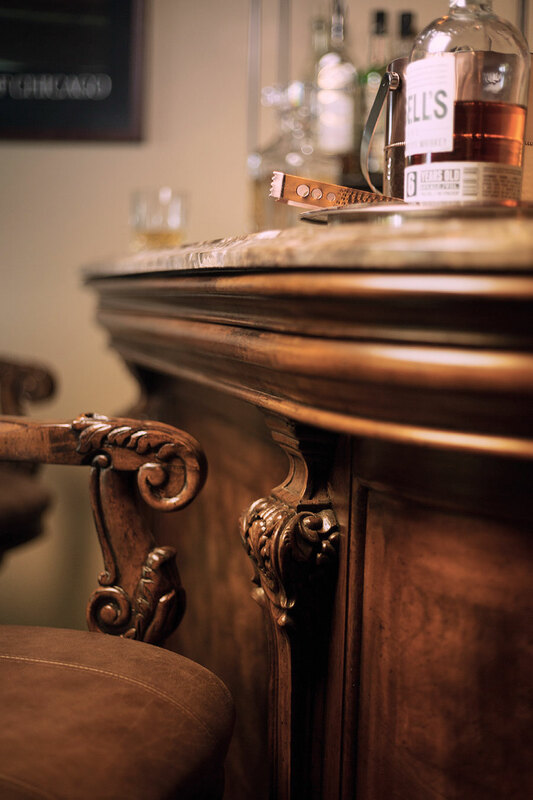 For the restored bar set to play its part as the anchor, the accompanying pieces – like these bar stools – had to look and feel every bit as genuine and seem as if they came from the same time and place. The finish of the bar set forms the darkest hue of the color palette for the room. With this established, the palette grows from there into analogous hues rather than complements. 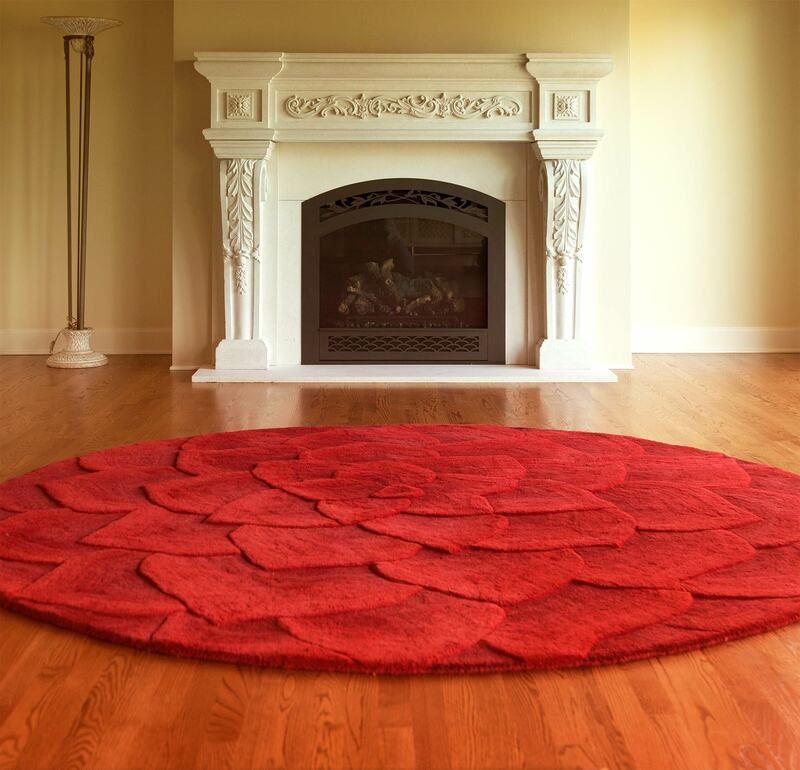 This keeps the visual attention of the space where it belongs – on good company and good conversation. 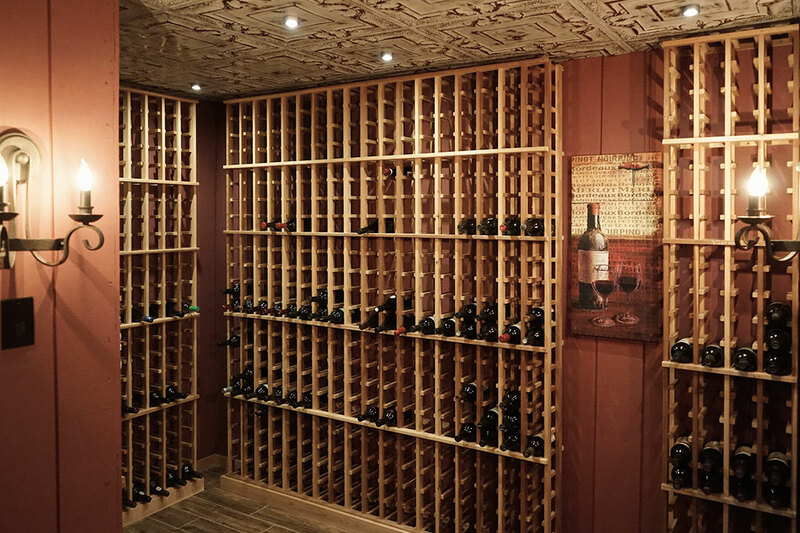 Wine racks of honey-colored wood were custom built to exactly fit the available space. Period light fixtures add to the allure of the small space, giving it its cellar-like quality. The tin ceiling, this time with distressed paint finish, unites the wine cellar with the larger bar. 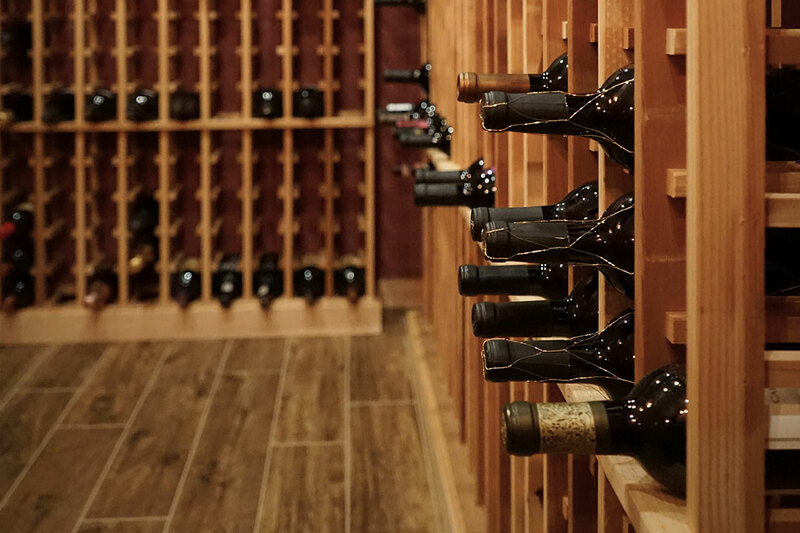 The natural wood color of the wine racks was left as-is to contrast with the bottle colors, forming a natural rhythmic grid. The rustic wood floor continues the illusion of a true cellar. 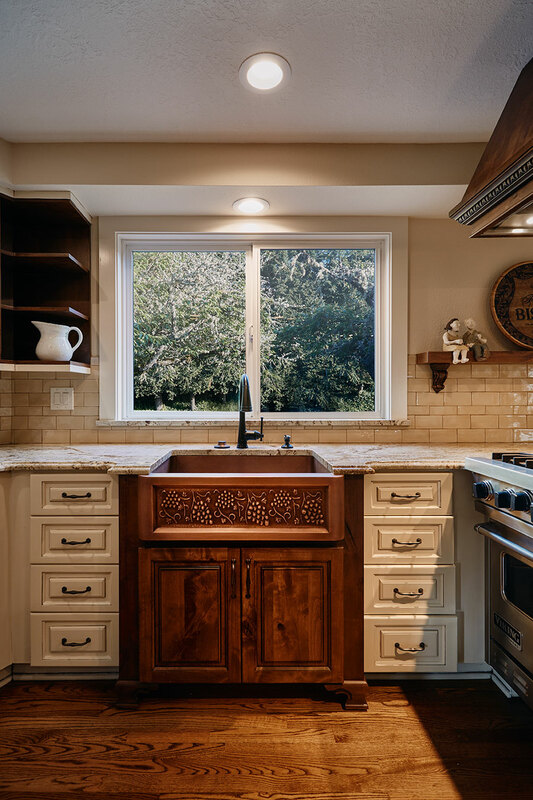 We brought new focal points to the kitchen guided by the same successful old-world formula established in the bar suite, by blending new wood shelving into the existing cabinetry, countertop surfaces analogous to the period, and the eye-catching embossed copper farm sink. 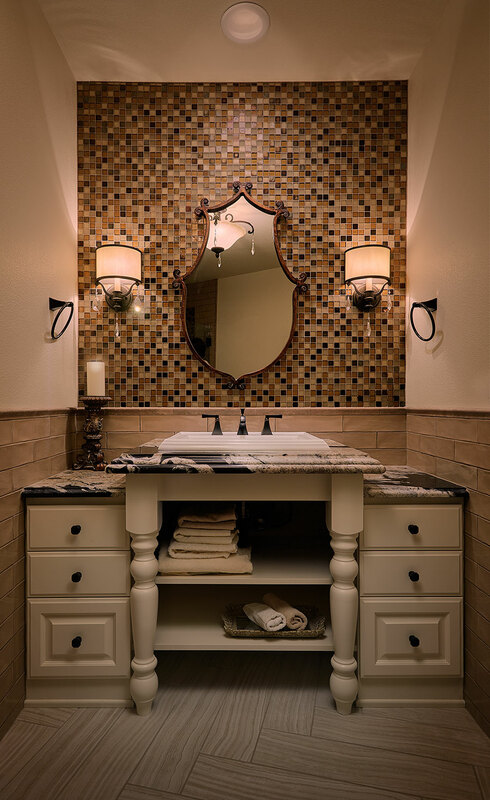 Highly polished but rustic hand-made backsplash tiles sparkle along the wall. 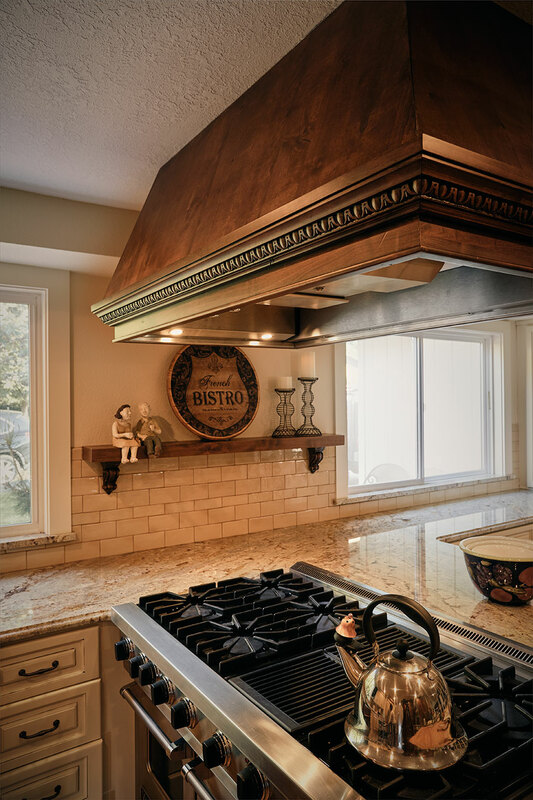 The no-nonsense range sits under a cleverly fashioned copper hood cover. 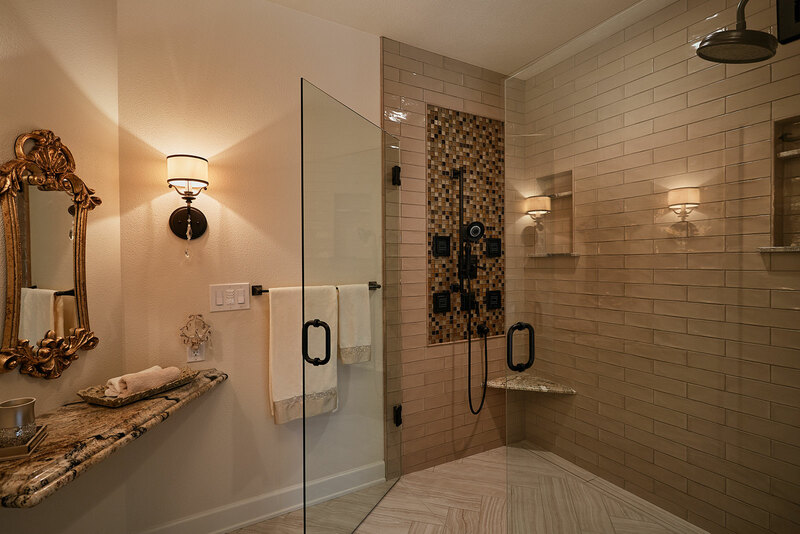 No threshold and a wide glass gate encourages a long revitalizing shower. Tandem fixtures allow a choice of flow types and strengths from a misty envelope to pulsing jets. The vanity to the left made a jewel of unused space. Becky puts her whole heart and soul (and time and energy) into each project. She brings an extreme amount of experience and knowledge to the table while always keeping her client’s wants and needs at the forefront." Everyone browses through design magazines, and when the homeowner found a pedestal-style vanity she loved, we designed and created this custom piece to fit an otherwise awkward space. Backed by glass mosaic tiles and elegant lighting with crystal drops, this became the perfect feature to complete the room. Creating a warm and inviting home is well on its way. The living room is off to a great start with the installation of this amazing, cast-stone fireplace, the inspiration and backdrop for this soon-to-be gathering place. The wood flooring and fireplace details replicate those in the kitchen creating a cohesive living area.